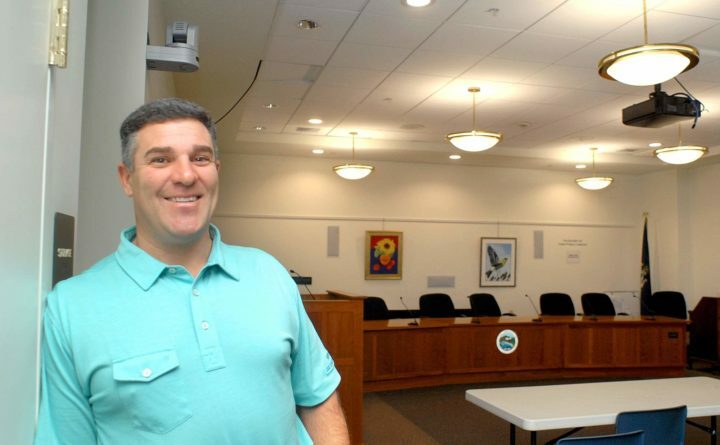 Eric Spenlinhauer of York is pictured at the York Library Community Meeting Room, where many local boards and committees hold meetings. Spenlinhauer's Town Hall Streams has grown over the past eight years to a company that offers municipal meeting streaming services to more than 70 clients nationwide. YORK, Maine — For eight or nine years, town hall denizens have been able to kick back at home and watch municipal meetings through Town Hall Streams. Anywhere or anytime, live or recorded, meetings are available to watch on any computer or mobile device at townhallstreams.com. A curiousness about what his children were doing at day care prompted Eric Spenlinhauer to create the Share In My Day website with a partner, Jason Parker, in 2009. Parents can, with passwords, access cameras at their day care center. While Spenlinhauer’s day care in York declined to install cameras, Share In My Day has caught on in the south, California, Texas and elsewhere. Spenlinhauer said parents watch their children, not the staff. An email from the school committee gave Spenlinhauer, of York, the idea to begin offering coverage of municipal meetings. The email urged parents to attend school board meetings, Wednesdays at 7 p.m. “Not a good time for parents to be at a meeting,” he said. At the time, meetings were shown on the town’s local cable station, Channel 3, but available only when the cable station scheduled them. York served as a pilot program for Town Hall Streams and was offered the service for free at first. When Spenlinhauer offered to stream all meetings, for $250 a month, the town signed up. By the beginning of 2010, Town Hall Streams was also offered in Kennebunkport and Kennebunk and four other towns. With a few clicks on a town’s website, the service allows residents to choose from a list of meetings to watch, live and archived. York already had cameras installed, and Spenlinhauer tapped into that system. When South Berwick signed a contract with Town Hall Streams in 2012, Spenlinhauer installed cameras in the Town Council meeting room. There is no cost to install the cameras if there are none, Spenlinhauer said. No longer can residents complain that keeping up with local boards and committees is often impossible because of early meeting times and busy lives. And no one has to look up a re-run date or record meetings by DVR device. Snowbirds and others who are out of the area can watch meetings and stay informed. Now, Town Hall Streams lists more than 70 towns with streaming, mostly in Maine and New Hampshire, but some Connecticut, New Jersey, New York and Maryland, including Maryland state government committee meetings. He scours the internet for requests for proposals (RFPs), announcements that a city or town is looking for video streaming. Spenlinhauer will then go to the location, even California, to install cameras. He has installations in two Army bases, where training graduations are held frequently. Spenlinhauer says he has competitors, but his price is good. “I stay up with the times,” he said, adding Facebook Live and improvements to the service. Meetings used to be archived for one year, but with improved servers, it’s now for five years. To stream and record a meeting, a town or city employee schedules the meeting; the average is three to five a week. “We don’t do parades or community television,” he said. A town like Exeter, New Hampshire, he said, has both streaming and a cable access station.